Angelina Jolie wants her children to pursue careers in politics. The Hollywood couple take their sons Maddox, 12, Pax, 10, and five-year-old Knox and daughters nine-year-old Zahara, seven-year-old Shiloh and five-year-old Vivienne with them while promoting their films around the world, but Angelina claims they also make them aware of the humanitarian work they do. “They know we make movies. But also that Daddy makes furniture and builds houses and that Mummy likes to travel with the United Nations,” she told The Sun. Will and Jada Pinkett-Smith are reportedly under investigation by child protection services. The Los Angeles Department of Children & Family Services are said to have been in contact with the parents after their 13-year-old daughter, Willow, appeared in a picture posted on the internet of her laying on a bed with actor Moises Arias, 20. “The investigation was formally opened last week and is being taken very seriously by the department. Will and Jada Pinkett-Smith have been extremely cooperative with officials. Of course, they aren't happy that their parenting skills are under scrutiny, but they understand,” a source said. Kylie Jenner has reportedly tattooed Lionel Richie's son. The reality starlet made her body art debut on Friday evening in a Hollywood recording studio when she inked her initials on 19-year-old Miles Richie's hand. The 16-year-old brunette was in the studio with her sister Khloe Kardashian and her boyfriend French Montana watching Miles get inked by artist John Petro when she decided to give it a go herself. In a video obtained by TMZ, a glove-clad Kylie can be seen copying John's hand movements as she tries to pick up the skill. The gossip site is reporting the LA County Dept. of Public Health has confirmed only those aged 18 and over can administer tattoos, so Kylie could be hit with a fine of up to $1,000. And John - who has tattooed the likes of Soulja Boy and Lil Wayne in the past - could have his license suspended. Ariel Winter's guardianship case has been resolved. The Modern Family actress - who plays Alex Dunphy in the series - will remain in the care of her older sister Shanelle Grey, who took on temporary custody of the 16-year-old star in 2012 after she claimed her mother, Chrisoula Workman, was physically and mentally abusing her. At a hearing yesterday, Chrisoula agreed Ariel could continue living with her sister - if she watched a video montage of family photographs in court. The young actress and other members of her family - including Chrisoula and Shanelle - sobbed as the video played, and then Superior Court Judge Daniel Murphy signed off on the custody agreement. The judge advised it would be up to Ariel to decide if and when she would visit her mother, but he would keep jurisdiction over her care until she turns 18, and her father Glenn workman will remain in control of her finances. Brad Pitt bought his son Pax a portrait of Justin Bieber. The 50-year-old actor purchased the piece which was created by street artist Bambi for his 10-year-old son and the image shows the “Baby” hitmaker alongside the words “Rebel without a clue.” A source revealed, “Pax loves Justin and so Brad thought this would be the perfect gift for him. Brad loves Bambi's unique style and this is his third purchase from her. When he found out she'd done a piece with Justin, he knew he'd have to get it for Pax. Kendall and Kylie Jenner are reportedly glad they're no longer friends with Selena Gomez. The 21-year-old singer reportedly cut ties with the sisters after the Coachella Valley Music and Arts festival earlier this month because she thinks they're a “toxic distraction,” and she thinks they're encouraging her to be a party girl. The “Come & Get It” hitmaker had formed a close bond with the famous sisters in recent months, but she made it clear their friendship was no more when she unfollowed them on her Instagram account last week. Angelina Jolie and Brad Pitt don't want their children to be actors. The couple raise six kids together - Maddox, 12, Pax, 10, Zahara, nine, Shiloh, seven, and twins Vivienne and Knox, five - and despite letting Vivienne have a cameo in her new film Maleficent, Angelina is not encouraging them to become screen stars. “We think it's fun for our kids to have cameos and join us on set, but not to be actors. That's not the goal for Brad and me at all. I think we would both prefer that they didn't become actors. But she was four at the time and other three and four year old [actors] really wouldn't come near me. Big kids thought I was cool - but little kids didn't really like me. So, in order to have a child that wants to play with [Maleficent]... it had to be a child that really liked me and wasn't afraid of my horns and my eyes and claws, so it had to be Viv,” she said. The 28-year-old singer - who was catapulted to the spotlight as a classical singer before branching into pop music in 2005 - can relate the young “Wrecking Ball” hitmaker, 21, who made headlines last year for a number of provocative performances, and expects she will change her attitude in a few years. “It's so obvious this young lady has a skewed perspective because of what she's been through. All she knows is to sell and be sold. This sounds patronizing but in a couple of years she'll change her tune. I went through a similar-ish thing, not to the depths she is taking it to. But it's exhibitionism. As a teenager, you're really egocentric. Why would you give a f**k about the rest of society,” Charlotte said. Jaden Smith has reached out to Shia LaBeouf, insisting he has a “fellow insane” friend in him. The 15-year-old star tried to visit the 27-year-old Hollywood actor - who wore a brown paper bag over his head to the German premiere of his new film Nymphomaniac earlier this month and has repeatedly insisted he is no longer famous - at his #IAMSORRY silent art installation in Los Angeles, and though they never got to meet, Jaden wants Shia to know he is “seriously” there to give him support. If you didn't want to wait in line for hours to see Shia LaBeouf's art installation (or if you just live nowhere near Los Angeles), now is your chance to see what everyone's been talking about - even when Shia isn't. An interviewer at Screen Junkies went into the exhibit armed with a video camera (check out the full video after the jump!) 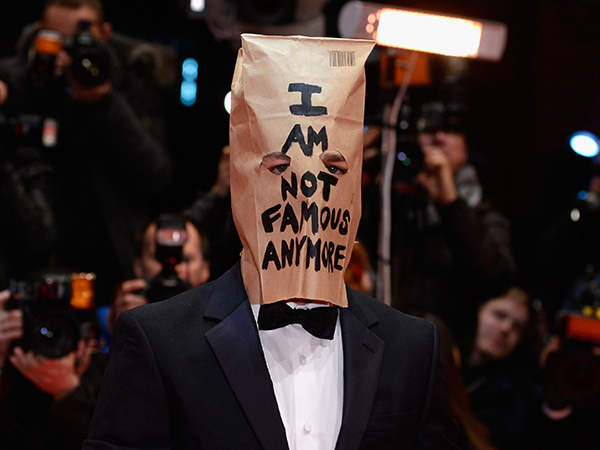 and immediately asked Shia to take the paper bag off of his head. 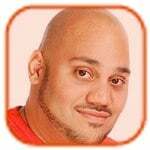 When the Nymphomaniac star didn't respond, the interviewer removed the bag himself and was in shock that it was the actor himself and not someone he, say, hired off of Craigslist. The 27-year-old actor remained seated and continued to stare forward with a melancholic look as the interviewer tried to get a response from him by showing him a clip of his younger self in Even Stevens; berated him about Indiana Jones and the Kingdom of the Crystal Skull; and then tried word association.